For years, to know me was to know that I loved a bold red lip. I didn’t go a block or a subway stop (or to the laundromat, to brunch, or pretty much anywhere) without it. For ages as a makeup artist I favored dark clothing, and spent at least 40 on my makeup application alone, that red lip was perfect and not going anywhere all day. A red lipstick was always my one, striking accent, with a nod to vintage makeup looks that influenced me from early on. 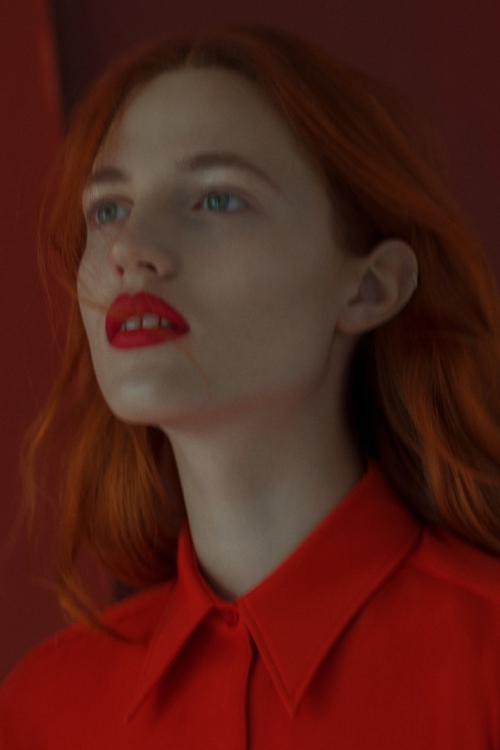 While these days I go for more "effortless french girl”, and tend to keep the vivid lip color to the models and artists I work with, I’m still in awe of the transformative power and visual impact of reds. “Veiled Red,” our newest editorial starring Julia Banas, was no exception. The whole thing was so rich in inspiration! 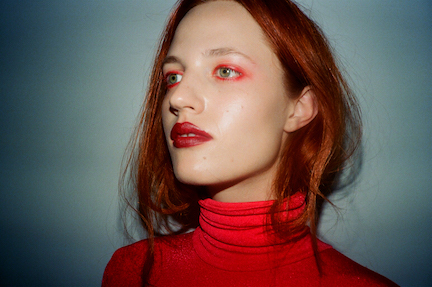 Julia is such a magical person and muse; her energy and natural beauty is so radiant, just like her bright red hair that provided the color inspiration for this shoot. Her hair has become her signature look, and is such a distinctive feature as a model. Veiled Red is also a story of color as power, because that end of the color spectrum is strong, warm and energetic. Red is a color of extremes, has a complex history, and has been an endless source of symbolism throughout history. Ancient cultures saw it as a primal color representing fire and blood. In some asian cultures, it represents luck and happiness, and Egyptians would color themselves with red paint during celebrations to convey health and life. Red also has a deep history with makeup and adornment, and has been used in beauty rituals spanning many cultures throughout history. Egyptian women would rub red ochre as a cosmetic to redden cheeks and lips, and henna was used to dye hair and nails. I love that it’s transcended centuries and cultures in so many ways like that. And, of course, there’s emotion—something that red is known for as it fuels creativity. It’s by far the most dynamic of all colors and can evoke mixed feelings like excitement, passion, anger, and anxiety, and often represents danger. 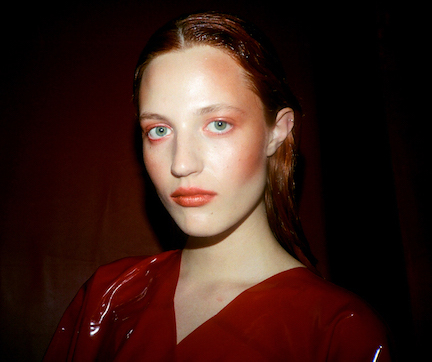 For our shoot, I wanted to create contradictory emotions using red with the subtleness of Julia’s beauty—the face is angelic, yet the makeup at times is bold and imperfect, creating a sort of tension to the image. Creatively, we wanted to use red in every capacity, every shade, texture and medium to manifest red’s many emotions within the viewer. I played with different shade variations from crimson, maroon, burgundy, ruby, rust and cinnabar. I used different textures to give the makeup design dimension and variation. Using mixing mediums and creating custom color and texture to me is the most enjoyable and fun part of being a makeup artist! This story has been one of my favorites to-date, mainly because everyone involved in the making of Veiled Red had such a warm creative energy. I don’t know if it was from being surrounded by such a vibrant color all day, feeding off of the color energy, or the Rosé, but it was truly a beautiful day on set! Please stay tuned for more Behind the Scenes Beauty stories and tutorials showing the use of different mixing mediums and uses of textures, like loose pigment on the lips and gloss on the eyes. I hope this story inspires you to activate your own creativity and use more color in your day-to-day. Never underestimate the power of a red lip!